Distribution and habitat: Crassula ovata is native to South Africa where it grows on rocky hillsides under the blazing sun. Rain there is infrequent and usually occurs during the winter months. 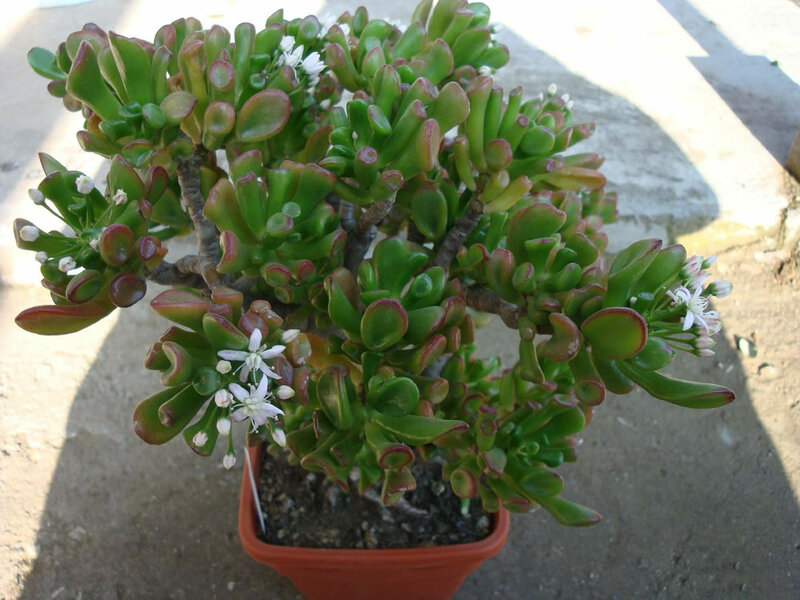 Consequently, Crassula ovata plants flower during the late winter. 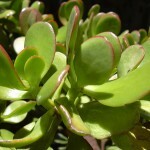 In addition with its adaptation of reducing the water loss, having succulent water-storing stems, leaves and swollen roots that give it the ability to survive droughts, Crassula ovata can also survive being grazed, trodden on or knocked over, as it is able to root from any piece of stem or even from a single leaf. 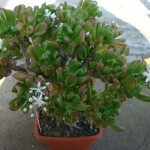 Description: Crassula ovata is a large well-branched, compact, rounded, evergreen shrub 1-3m (3-10 feet) tall with glossy, dark grey-green, oval, succulent leaves and rounded heads of pink flowers in winter-spring. The stem is stout and gnarled and gives the impression of great age and its branches are also short and stubby, but well-proportioned. Branches are succulent, grey-green in colour and in older specimens the bark peels in horizontal brownish strips. Trunks to 15cm (6 inch) in diameter can develop on older plants. The leaves are 3-9cm (1-3.5 inch) long and 2-4cm (0.8-1.5 inch) wide, egg-shaped to elliptic, often with a red margin and a somewhat pointed end. They are in opposite pairs, the one pair arranged at right angles to the next, and they are clustered towards the ends of the branches, but they may grow for many years without blooming. When flowers appear, the bush is covered in masses of sweetly scented, pretty pale-pink, star-shaped flowers in tight rounded bunches during the cool winter months. The flowers develop into small capsules, each holding many tiny seeds. 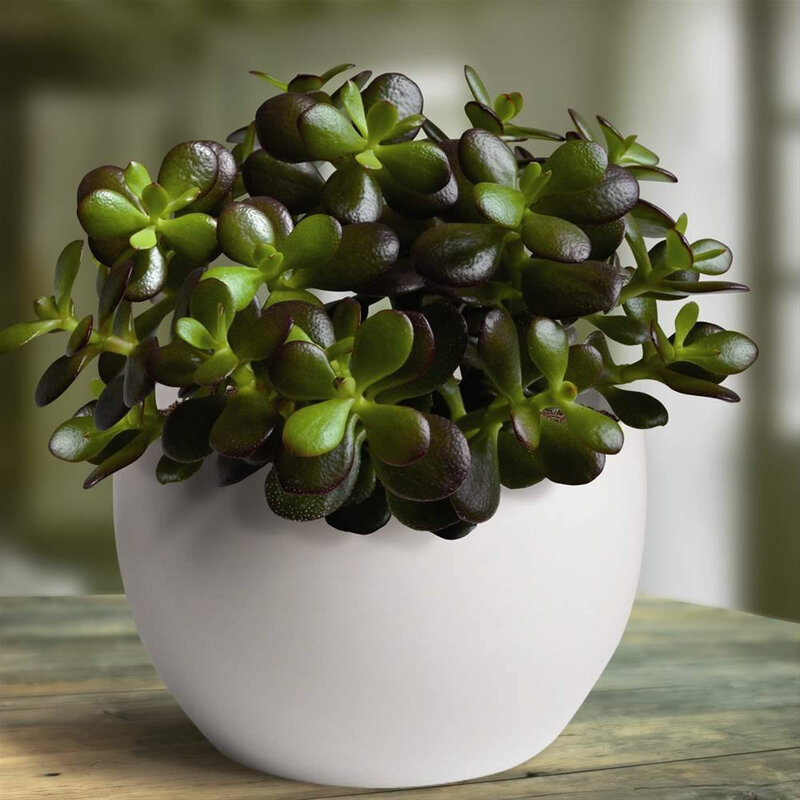 Houseplant care: Crassula ovata plants make an ideal house plant as they can cope with dry conditions and can survive being neglected. Cleanliness is important for the health and good appearance of the plant. All dead leaves and stems should be removed. Clean the leaves of the plant monthly using room temperature water. Do not use leaf shiners or oils to clean the leaves of Crassula ovata. Light: Crassula ovata plants need bright light with some direct sun light. A sunny windowsill will be an ideal position for these plants. They will not flower without sunlight and inadequate light will cause developing spindly growth. Temperature: Crassula ovata plants grow well in warm position during the active growing period, but they need cool temperatures during winter rest period when they should not be subjected to temperatures above 12°C (54°F) and they can tolerate temperatures down to 7°C (45°F). Give ventilation in summer and stand outside when conditions are favourable for Crassula ovata plants – enough hot and sunny. Watering: Water regularly and thoroughly during the spring and summer, but avoid overwatering; allow two-thirds of the potting mixture to dry out in between waterings. Little and often is the watering rule for these plants. Keep on the dry side in winter, particularly when conditions are cool; the leaves will have stored a good deal of the previous summer moisture and will be in little danger of suffering from dehydration. Feeding: Give very week liquid fertiliser once a fortnight during the spring and summer. Do not fertilise during the rest period. Potting and repotting: Use a mixture of three parts of soil based potting mixture to one part coarse sand or perlite. 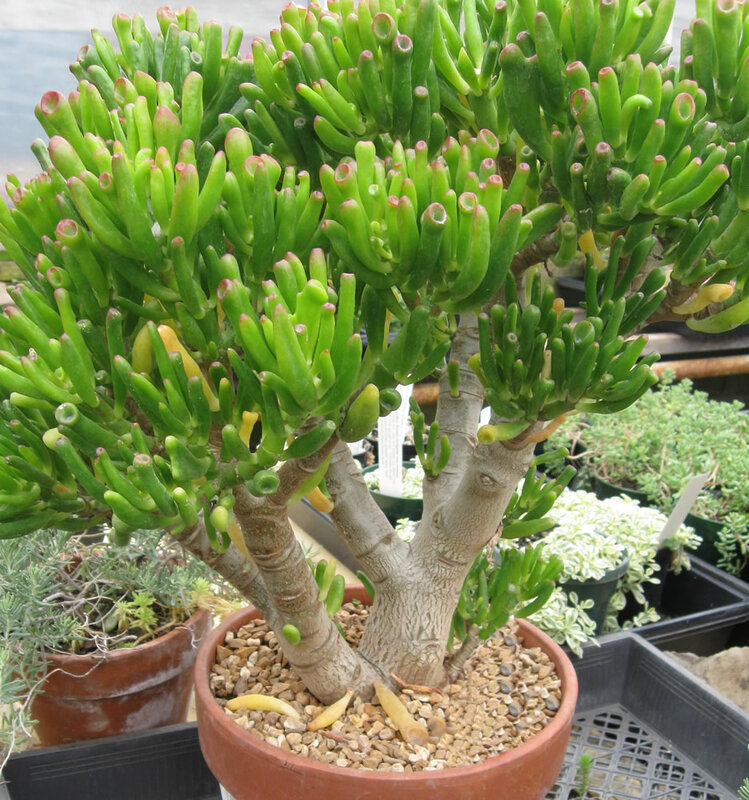 Crassula ovata should be moved into pots one size larger only once every two years. It will require a maximum pot or small tub size of 20 or 25cm (8-10 inch). At this point, top-dress the plant each spring with fresh potting mixture. Shallow pots are best for these plants. These plants tend to have shallow root systems and often become top heavy. In such cases, use heavy clay pots. To maintain a plant at about the same size, treat in a similar way to a bonsai tree. Prune the roots when re-potting into the same size pot and cut back the stems to maintain a pleasing shape. This will help to develop a thick main trunk. Prune back to just above the rings on the stems where the old leaves were located. New leaves will grow from these locations. Gardening: Crassula ovata is easy plant to grow. It comes from a frost-free environment, but it should tolerate a winter minimum of -1° C (30°F) when it is planted in ground. 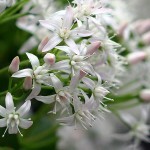 However, it is best protected from frost to prevent the flowers from being damaged. Location: Crassula ovata thrives in full sun or semi-shade, but will flower best in a sunny position. To induce a potted specimen to flower, move it into a sunny or brightly lit position during summer and autumn – but if it has been in a cool low-light spot remember to introduce it to stronger light gradually or the leaves will be scorched. 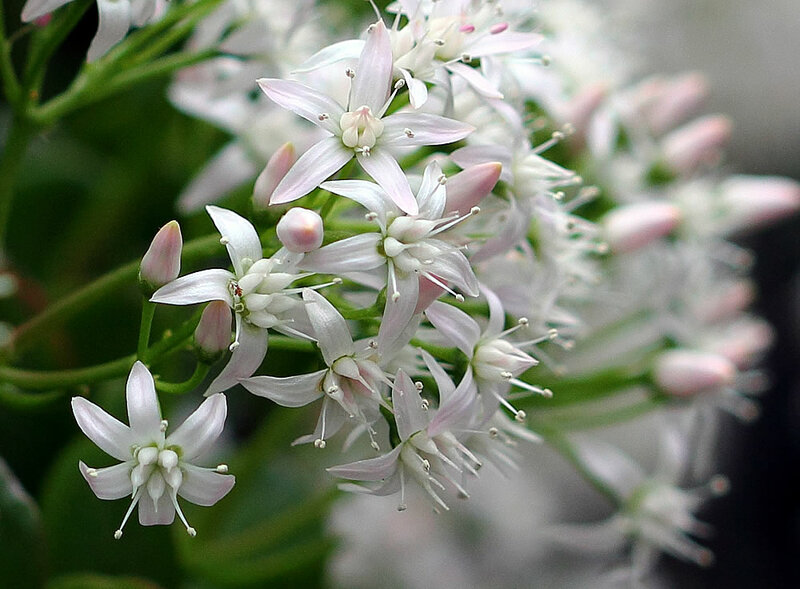 Soil: While growth is very slow, Crassula ovata is extremely tolerant of poor, dry soil. It grows in normal loam soil with good drainage. Fast draining soil is necessary to avoid root rot of these plants. 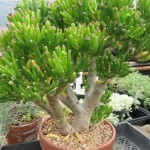 Irrigation: Crassula ovata plants should be well watered and allowed to dry thoroughly before watering again. Do not to overwater these plants. They are tolerant of drought, wind and coastal conditions. Crassula ovata will tolerate periods of drought effortlessly, but will soon rot if left to stand in wet soil. During the winter months, plants are watered only enough to prevent the leaves from shriveling. Fertilise: Mild liquid fertiliser used at monthly intervals during the active growing period will be provide adequate fertility. Do not fertilise during the winter. Propagation: Individual leaves of Crassula ovata will root readily in the recommended sandy potting mixture if kept in warm room in a position where they can get bright filtered light, but more satisfactory way to propagate in by 5-8cm (2-3 inch) long stem cuttings or basal offsets. The cuttings or offsets should be taken in spring. Plant it in a 5-8cm (2-3 inch) pot of equal parts mixture of peat moss and sand and keep it at normal room temperature in bright filtered light. Water the cuttings or the offsets moderately, just enough to make the potting mixture thoroughly moist and allow the top couple of centimetres of the potting mixture to dry out between waterings. Give it some standard liquid fertiliser about once a month. 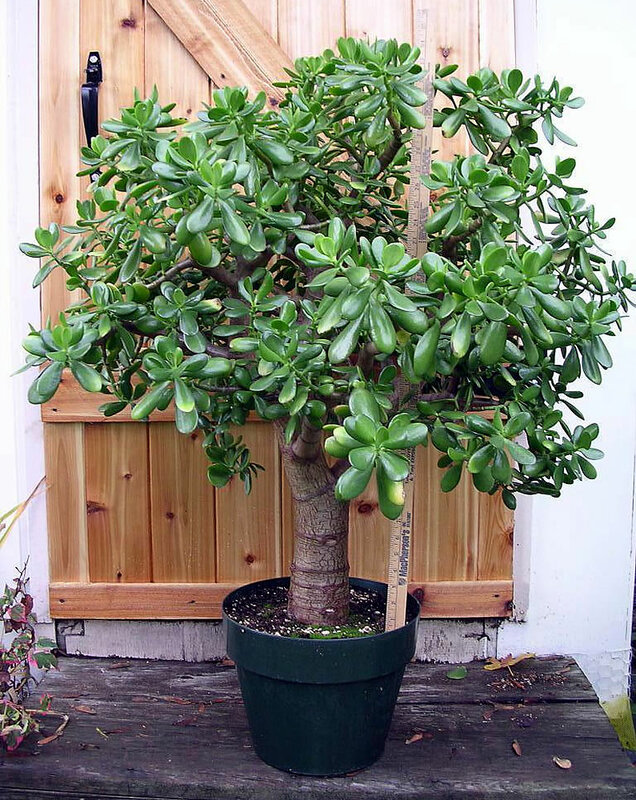 When the cuttings are well rooted – in about three months – move the young plant into a one size larger pot of recommended potting mixture and treat it as a mature plant. Rotting at the base together with wilting of the plant top is probably due to overwatering or to poor drainage. Brown shriveled patches on leaves indicate inadequate watering. Crassula ovata is sometimes attacked by mealybugs. 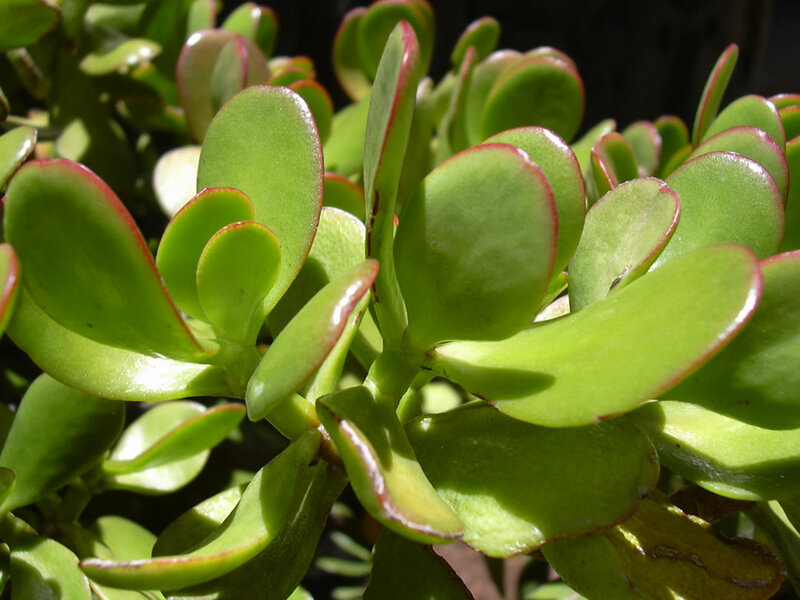 Treatment: Use a suitable pesticide for Crassula ovata as these succulents are sensitive to certain insecticides. 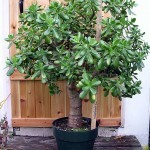 Before using a spray insecticides make sure that the product used is labeled for jade plants. Notes: The genus Crassula is one of the most diverse succulent genera, varying from tiny moss-like annual plants to 3m (10 feet) tall succulent ‘trees’ like Crassula ovata. There are more than 300 Crassula species of which approximate 150 are found in southern Africa where they are widespread, but concentrated in the semi-arid winter-rainfall areas. The centre of distribution of this genus is in southern Africa, but they extend beyond Africa into Europe, America, Australia, New Zealand and the southern islands. Crassula ovata ‘Convoluta Gollum’ (= Crassula ovata ‘Gollum’) (Gollum Jade, Trumpet Jade, ET’s Fingers) has tubular leaves, trumpet shaped, each of them tipped with a suction cup, 4-ranked (decussate), smooth, deep glossy green in color with very light spotting usually with bright red leaf margins; the new growth is reddish. It is a small sparingly branched, shrubby, erect, succulent, that can slowly grow up to 50-80cm tall by 30-60cm (12-24 inch) wide. Crassula ovata ‘Convoluta Hobbit’ (= Crassula ovata ‘Hobbit’) (Hobbit’s Pipe Jade, Hobbit Jade) has leaves that are nearly tubular and curled back around. Crassula ovata ‘Minor’ (Crassula ovata ‘Minima’) is a dwarf has glossy green thick fleshy leaves with reddish edges. The trunk and branches on this plant are thick.It will grow to maximum height of 50 to 75cm (20-30 inch) with a with of 25 to 50cm (10-20 inch). Uses and display: Crassula ovata is a wonderful sculptural plant for pots, tubs, rockeries, retaining walls and gravel gardens and is the ideal plant for a water-wise garden. It can also be grown in pots indoors. 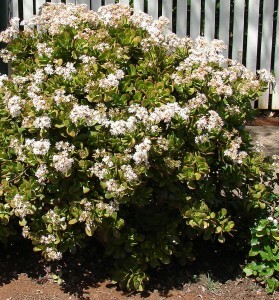 It have long been used in containers where they will live for years in root-bound conditions but can also be used as specimen or hedge plantings outdoors in full sun, part sun or deep shade. In the Far East, Germany and the USA it is traditionally grown in square porcelain tubs with ‘lion feet’ to bring good financial luck and has attracted more common names including the Money Tree, Penny Plant, Dollar Plant and Tree of Happiness.